Several changes may have to be made to the new European Commission, its president-designate Jose Manuel Barroso said a day after withdrawing his team. 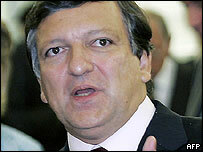 "There may be several changes - that's a possibility," Mr Barroso told BBC Radio 4's Today programme on Thursday. The most controversial nominee was Rocco Buttiglione, whose conservative views on gays and women drew strong opposition in the European Parliament. But Italy says it is standing by its nomination of Mr Buttiglione. On Wednesday, Mr Barroso postponed a crucial vote in the parliament in Strasbourg rather than face a veto by MEPs. Is free speech banned in European politics? Rocco Buttiglione talks about what he believes. Is that wrong? Mr Buttiglione, a staunch Roman Catholic put forward for the post of justice and home affairs commissioner, recently remarked that homosexuality was a "sin" and that single mothers were "not very good people" - comments which outraged many MEPs. It is widely believed that he will have to quit for Mr Barroso to get MEPs' approval for his new team. Mr Barroso said he would consult parliamentary and EU leaders, who are responsible for nominating the commissioners, before putting forward a new line-up. The crisis has overshadowed Friday's summit of EU leaders in Rome, where they will sign the new EU Constitution. Asked about the MEPs' opposition to Mr Buttiglione, the commission president insisted that it was not just a matter of one portfolio. "We have here different political families, not only one," he said. "It simply could not have been a solution to move one member of the commission - that could have been accepted by some groups in parliament, not others. "It was not an option... if I changed a single commissioner it would have a domino effect, and would be very bad for the commission and EU as a whole." Mr Barroso said he wanted to resolve the commission problem as soon as possible, but gave no date. He denied suggestions that he had been weakened by the debacle. "All the leaders of the relevant political families said it was the right decision, they congratulated me." Mr Barroso said it was not the right time to change the EU's voting procedures - MEPs can only accept or reject the entire commission, not individual commissioners. "I understand there is a problem. It's a very complex system, I have to live with it," he said. Many MEPs believe they have achieved an important breakthrough for democracy in the EU. The new commission had been due to start work on 1 November. The 24 new commissioners under Mr Barroso were nominated by the governments of individual member states. Incumbent Commission President Romano Prodi and his team will now remain in office until a new line-up is approved, but there is no clear protocol on how to proceed. Parliament President Josep Borrell said the EU was now entering "virgin political territory". MEPs have also voiced doubts about several other commissioners-designate. Neelie Kroes, the Dutchwoman who was to take the competition portfolio. Should Barroso reshuffle his team?